Our general view is Japan is likely to go higher as the currency weakens, however without any serious reform Japan will hit the wall and stagnate (unlikely the place to be longer term). Europe will continue to experience deflation and more social unrest as the policies of government continue to drag the economy to its knees. Emerging markets with will low debt will perform better than others. The US dollar is very oversold and is due for a rally (the world’s core economy has never seen hyperinflation in any period of history) As interest rates rise this will bring on more fear of government and their ability to pay interest on Debt. This is when you will see gold rally to new all time highs in the next 3~5 years. I believe that gold will bottom in 2014. In a Fed tightening cycle, gold tends to go down. Financial players in this cycle have been impatient to kick gold down as hard as possible. They short gold producers first and then gold. The gold stocks are much bigger in value than gold market per se. Hence, the trading strategy of shorting gold stocks and then gold could be lucrative. As more and more people pursue the same trade, the gold is kicked down way beyond its fundamentals. Gold demand is from emerging economies. The latter have been experiencing high inflation. The demand for gold has been strong despite the weak gold price in 2013. The current gold price is already below the production cost of some of the biggest mines in the world. I suspect that, in 2014, some mines may be shut. The reduction in supply will become a counterforce against the Fed’s tightening. 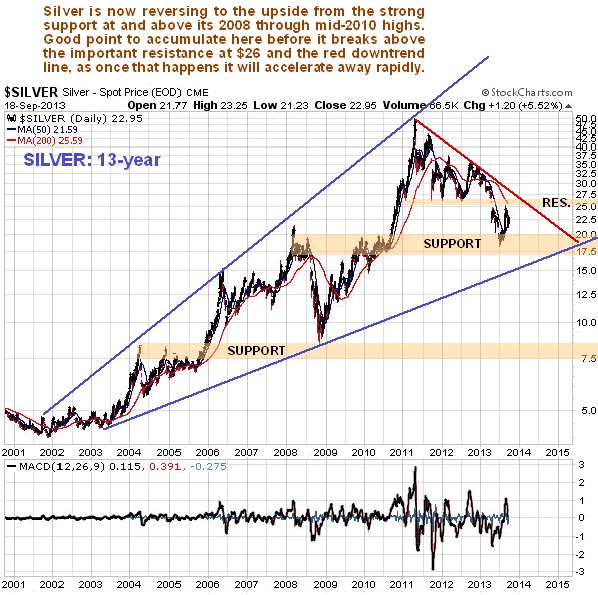 I want to repeat my long term bullish call on gold. Its price is likely to top US$ 3,000 in five years. The currency market instability and the likely global stagflation will strengthen gold demand for wealth preservation in emerging economies. As supply is unable to grow, the price has to rise to balance the market. Overall there will be a move from Public to Private assets and this may very surprise everyone with the short term gains we will see in the USA markets, there will be corrections and one should buy when the markets have a downdraft, perhaps this first quarter. As we have been saying if you have borrowed in Yen and don’t rush pay it back (yet) — take whatever cash you have and buy dollars and US blue chips, Energy, Agriculture and gold. (wait on gold with large lump sum additions until the dollar takes off). Why will the dollar will soar to new highs? First, Japan above and second, stop and look at Europe. The smart Europeans will move their cash to the USA before they can’t get out or go to Asia, maybe better. But the bottom line – it is the dollar that is becoming the ONLY game in town. Gold will be held back initially as DEFLATION continues my guess is 2014-5 gold will start take off again so my advice is to accumulate now on dips, even start a savings plan buying a set amount of gold and gold equities each month. Then ramp up on lows. The banking crisis in Europe is worse that the US ever was. The US was a trading loss, Europe is a systemic failure that is more than $1 trillion in bad loans when the USA was $700 billion.